I was fortunate enough to be have been able to chat to Dale on the Thursday before he passed away, which was Saturday 28 May, 2013. 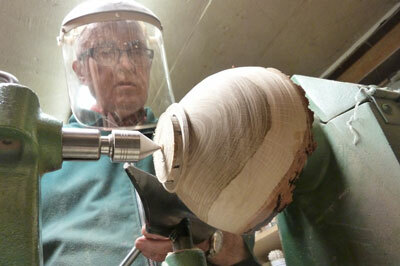 This article was going to be featured in Woodturning magazine, but instead we had to run something completely different. With his family's permission, I am able to run this profile on one of the world's leading experts and proponents of woodturning. Dale was born and raised in Cardston, Alberta, Canada, and was the eldest of three children. How his family came to be in Alberta is an interesting story, as I will go on to show. Dale's great grandfather, Robert MacNeish, was living near Edinburgh when he joined The Church of Jesus Christ of Latter-day Saints (Mormons). In 1855 Robert decided to up sticks and move to the USA. He went to New Orleans, continued up the Mississippi and on to Council Bluffs, Iowa - about 150 miles north of Kansas City - at which point he joined with other Mormon pioneers headed in their trek west to Salt Lake City, Utah, by way of wagon train. Robert settled in Utah in 1856. Dale's grandfather - one of 15 children - was born in Utah in 1857. He, one of his brothers and a sister were sent by Brigham Young, along with many others, to help 'homestead' - acquire and occupy land - southern Alberta, Canada. They travelled by horse and wagon, eventually settling in the Cardston area. Upon arrival, they duly homesteaded, which involved finding unclaimed land, going to the local city council and filing a claim on it. This meant they were committing to improve the land within a two-year period. This they did and the land was theirs. The great grandfather had six children - four boys and two girls - and Ray, Dale's dad, was the eldest. Ray had a country store selling general grocery items and suchlike and it also included a post office. Dale's mum, May, and dad also drove the school bus for over 40 years. Their land included a farm with about 160 acres of grain/wheat farming as well as land for some pigs, chickens, cattle and turkeys. 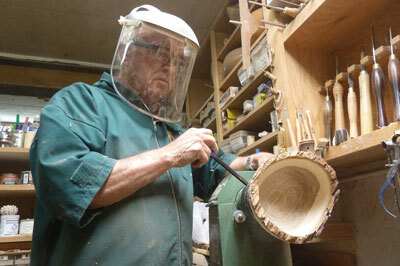 Dale recalled how he got started turning: "I started woodturning in eighth grade when I was about 14 or 15 years old. I went into the shop - boys did shop and girls did home economics back then," he commented. "I had never seen a machine run by electricity then and there was this lathe over in the corner. 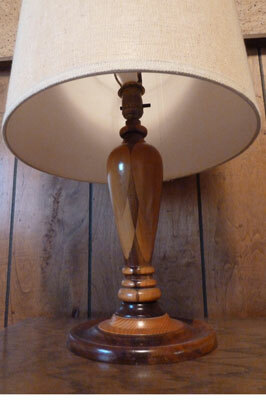 I guess it was made in about 1950 or 1951. Mr Weiler ran the shop and I asked him what it was and if I could use it. Mr Weiler told me he didn't know ow but would help me learn. I was given a copy of the Delta book Getting the Most Out of Your Lathe - and did most of the projects in it by the time I was 15 or 16." Dale graduated from high school in 1951 and this was also the year that he married Norene, on 3 October, although she sadly passed away in September, 2011. It was around this time that he went to Calgary University for one year, after which he moved back to the Cardston area with a temporary licence to teach first to sixth grade students. Dale recalled that the area he was in was predominantly a Hutterite community and the first graders spoke German, not English. He taught there for one year then transferred to Spring Coulee, which was 18 miles northeast of Cardston. He spent two years there as Principal of the school, teaching seventh to ninth graders who were aged between 13 and 16 years old. At the end of two years, Dale decided he needed more education, so in 1954 he went to Brigham Young University (BYU) in Utah. He gained a master's degree in technical education in 1958. During his time at university, Norene and Dale had two children: Deanna and Randy. Dale commented that he did bricklaying and also bagging groceries in a local store: "Any way to make a living. I had a lot of bills to pay," he chuckled. After Dale graduated, the family moved back to Cardston and built a new home. Dale commented that it was the first brick home built there in 50 years. By 1965 Norene and Dale had added four more children to their family: Don, Darrel, Brian and Karen. While talking about 1965 Dale said: "I didn't think there was any future in school teaching and I certainly didn't want to go into teaching, so I decided the only way up was to move out. I enrolled in the doctorate program at Washington State University. There I studied curriculum education and minored in industrial education. I was there until 1967. It was during my last few months that BYU phoned and offered me a job on the faculty as Assistant Professor in the College of Engineering and Technology. 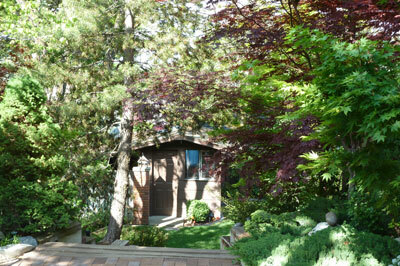 During 1966 and '67 I had a house built in Provo, Utah. I had made a lot of contacts back when I was bricklaying, so we were in that home for quite a few years before I eventually built my own," he told me. "One of my early assignments at BYU involved working with potential industrial education teachers. The first year had me teaching, some of which involved being in the woodworking lab. I also had to purchase all the materials required. One supplier I used - Byrd Pearson, who owned Pearson Cabinets - had a fully functioning shop and I saw his father - E N Pearson, a retired teacher from Lehi High School - turning. He loved turning and I asked to photograph him as he was working. Another role I had was as coordinator of instructional films and the photos that I took - black-and-white - were mounted in an album for instructing students. Many came back and asked for copies and I decided then that there was potential for a book on the subject. 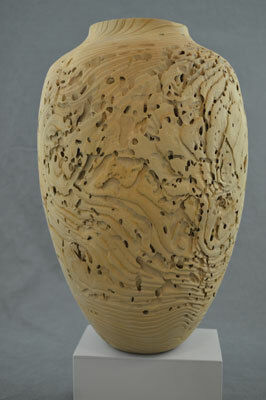 There weren't many books, other than Peter Child's, about woodturning at the time." "Photographing E N Pearson woodturning was what started off the thought process behind my first book Creative Woodturning, which was published in 1976 and went on to sell over 300,000 copies. 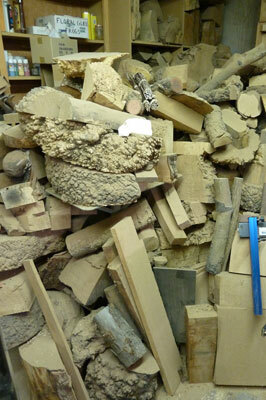 This was also the year that Fine Woodworking magazine started," he commented. "œIt was soon after, in about 1977, that Albert LeCoff talked to me about demonstrating at one of his symposiums. He and Palmer Sharpless decided to do seminars in the Philadelphia area at the School of Industrial Arts. Both Albert and Palmer got the ball rolling as far as symposia and demonstrations in this way are concerned." "About the same time as this the university administration asked each department to develop an area of excellence. We elected to make woodworking our centre of excellence, and from this decision there developed summer courses in carving, turning, cabinetry, furniture making and finishing. The department grew with more instructors and turning became the centre of excellence. 1979 saw us put on the first symposium, called Woodworking West, at BYU and the organising group was Bob Brenner (the maintenance manager), Mrs Porter (secretary), Garth Hill (department teacher and faculty member), and myself. We had 40 people attend and the demonstrators were Alan and Albert LeCoff, David Ellsworth, Bob Stocksdale, Frank E Cummings and myself. 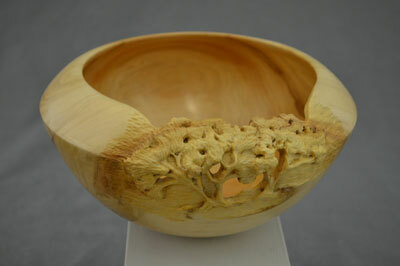 The name of the symposium was changed to the Utah Woodturning Symposium straight after this." 1983 saw Darrel - Dale's son - come back from his mission in North Carolina and there followed a discussion about whether he wished to go to university. After a long silence, Darrel said no. Dale dropped his head, looked over his glasses and chuckled at this point. He commented that a further discussion as to what to do ensued and mentioned that the construction industry was in the toilet at that time. Together, they agreed that there was the potential for a mail-order business to service woodturners in the USA and that this was a good idea. Craft Supplies USA was duly set up by Darrel. He and his mother worked together in the early days and over time it developed into the company it is today. "This was an exciting time," said Dale. Dale commented that he was privileged to have written six books in total. 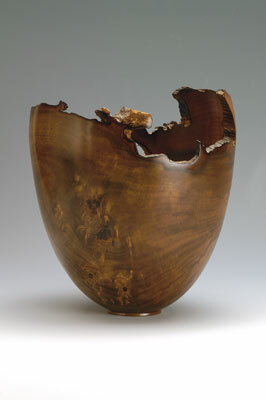 In 1980 he wrote his second book, Artistic Woodturning. "I find writing interesting," he said. "I like sharing ideas." 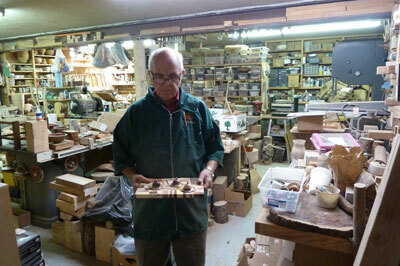 He followed with Master Woodturners in 1986. 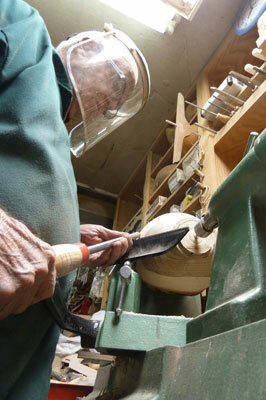 "In 2004 I wrote Woodturning with Ray Allen. It would have been a great shame if all his knowledge and skill had gone unrecognised and not written about. He was a great turner. Also in that year Kip Christensen and I wrote Beneath the Bark together. 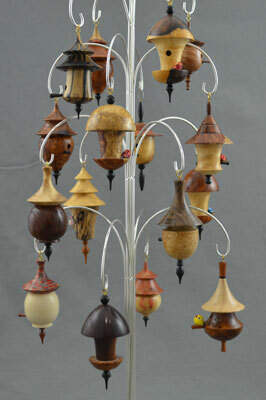 Last year - 2012 - Susan Hendrix and I wrote a book called Woodturning Christmas Ornaments. So six books in total." 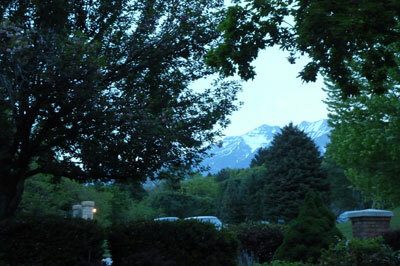 The Utah Woodturning Symposium has gone from strength to strength. 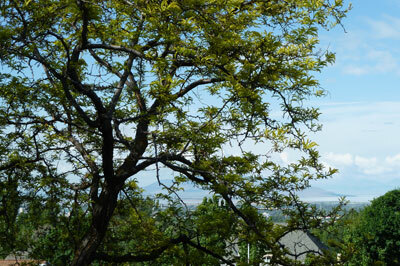 In 2008 it changed venue from BYU to Utah Valley University (UVU) and has been there ever since. In 2012 there were 350 attendees and around 20 demonstrators, and there are numerous scholarships for youngsters to come and learn there, too. 2013 saw Dale demonstrate at the Utah Symposium, cracking his one-liners as he did so, to much laughter. Dale commented: "The symposium was a great success and just keeps on getting better. I am proud that we can offer so many scholarships to the turners. It is a joy to see them have fun and take an interest, and being able to encourage and support them is very good." It was over the week following the symposium that Dale, his wife Sharon (whom he married in 2012), and I went out for a few meals. I came to find that he loved Mexican food, chocolate and ice cream. On a trip to Sundance Valley we couldn't get on the ski lift to the mountaintops due to adverse weather, however, we did have a wickedly good brunch. He commented to me with a big grin when I went back for dessert: "You sure got your money's worth." More than once over that week he had me crying with laughter and he was never short of a wisecrack comment to keep me on my toes. 1. There isn ot anything I wish I had done. I have lived a good life, my work was also my hobby and I have enjoyed what I have done. 2. A lot of people go through life without meeting a top-line person. I am fortunate to have met over 100 and to have been able to rub shoulders with them. .3 I have had the good fortune to have met lots of people. I have over 2,000 pieces in my collection of turnings and have enjoyed spending time with and liked the people I have work from. I have pieces to remember people by. 4. If someone granted me a wish, I would ask to be able to continue what I have been doing, but I would like slightly better health. 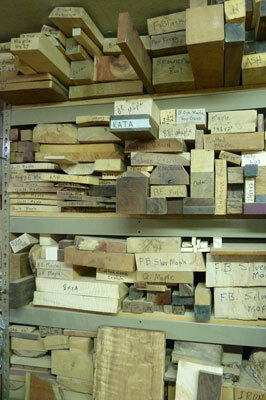 What Do You Think Are The Greatest Developments In Woodturning? 1. Improvement in the equipment available has been a big development as well as the quality of the lathes themselves, but evermore so with the ancillary equipment. 2. Written and visual information is more available than it has ever been. 3. There are also more top-quality craftspeople than there ever has been. 4. Symposia to disseminate information â€“ lots of things are happening and people can find out how and why at such events. 5. There are some wonderful developments for turners. There are some, however, that are not. Here Dale gave one of his wry smiles and I could not get any further information regarding the last part of his statement. 1. One of the things that bothers me is people not giving recognition for work influenced by someone else. Demonstrators must expect to have work copied, so stop moaning about it. But if someone copies or is influenced by the work of someone else, then give credit. 2. I have a difficult time being around English people - he said with a huge grin. What Do You Most Enjoy About Turning?